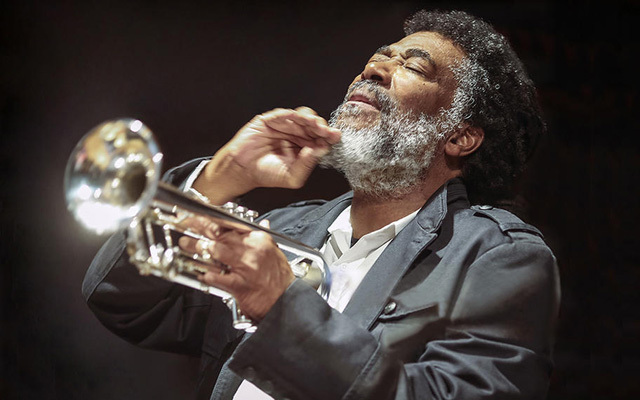 For five decades after lighting out on his own from the Association for the Advancement of Creative Music Wadada Leo Smith has ‘sung’ with his trumpet and scored his compositions for various ensembles in a unique systemic musical – melodic, harmonic and rhythmic – language: Ankhrasmation. The word is a neologism formed from “Ankh,” the Egyptian symbol for life, “Ras,” the Ethiopian word for leader, and “Ma”, a universal term for mother¬¬. His scores eschew (and at times incorporate) traditional notation in favour of symbolic compositions of color, line, and shape. These provide specific instruction for the seasoned improviser while allowing musicians to bring their own special expertise and individual strengths to each performance. Throughout these fertile years his intense and, at times, surreal music has filled a myriad classrooms where young aspiring musicians have attended his master classes. It has also lit up hundreds of performances both on the concert stage and in the studio where he has brought a daring sense of theatricality and biting irony to post-war music than virtually any other member of the avant-garde. Despite consistently destroying the tonal rulebook Mr Smith has, nevertheless, espoused a neo-tonality. Yet in all his theatricality Wadada Leo Smith has never missed a beat when it came to following his conscience; something that has prompted him to fire musical broadsides against systemic racism and other blighted aspects of Americana, always been concerned about relating to history rather than subverting it. On these two of his 2017 TUM recordings Wadada Leo Smith celebrates musicians who have been inspirational in his own development, and whose music has also been born out of pain; music that arose out of a deep sense of being marginalised and even dispossessed both socially as well as aesthetically. On both recordings, Wadada Leo Smith eschews the complexities of much modern music and remains stunningly lyrical. Whether playing in concert with other musicians or solo the translucent sound-masses of these works are created out of microscopic tangles of instrumental lines – a kind of micropolyphony – in which melody, counterpoint and harmony (in the case of the guitar-driven ensemble) and rhythmic outbursts gradually become clearer to create a musical world that is at once eerie and beautiful. 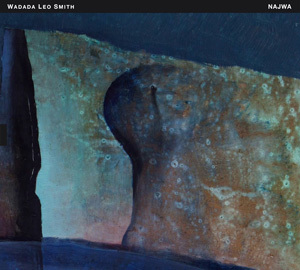 Wadada Leo Smith: Najwa Wadada Leo Smith’s music on this recording is written for an essentially guitar ensemble. The works are dedicatory in nature but also written to be interpretations of the music of those whom he is celebrating – such as the Harmolodic adventures of Ornette Coleman, the spiritual flights of John Coltrane, the polyrhythmic symphonies of Ronal Shannon Jackson and the elemental musical beauty of Billie Holliday. Every one of the five pieces is visionary orchestral works born of the compositional dexterity of a genius. The performances of guitarists, Michael Gregory Jackson, Brandon Ross and Henry Kaiser, the latter a long-time associate of the trumpeter, with or bassist Bill Laswell, drummer Pheeroan akLaff and percussion colourist Adam Rudolph are sublime. The performance gets it right as it establishes the perfect balance between the expansive orchestral writing and the more delicate solo parts played exquisitely by each musician. Wadada Leo Smith treats his own gloriously long-breathed phrases like song. His sense of line, subtle shifts in pace and dynamics have all the naturalness and control of a great opera singer. 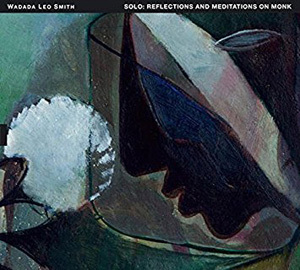 Wadada Leo Smith: Solo: Reflections and Meditations on Monk The manner in which this repertoire has been arranged on the recording would suggest that Wadada Leo Smith has something of an extended-form-Monk. It almost appears as if the composer (Wadada Leo Smith, in this instance) might easily have even added a libretto to this recording and turned it into a modern day opera seria. As it stands, though this is a serenely resplendent dialogue between Wadada Leo Smith and Thelonious Monk – the latter represented by his music and a piano that may be absent here, but the ghost of which always seems in the shadows and echoes of Mr Smith’s trumpet. The spirit of Thelonious Monk’s piano parts proceeds from his own compositions (interpreted here by Wadada Leo Smith); and each is magnificently integrated into the original compositions by the trumpeter that extend from the distant boundaries of the (preceding) Monk piece. In each of (the four original) compositions there is an emphasis on sonority unique to Thelonious Monk’s music. The result is a recording that is highly Romantic but at the same time wonderfully deft and delicate.